Be the first to share your favorite memory, photo or story of West . This memorial page is dedicated for family, friends and future generations to celebrate the life of their loved one. 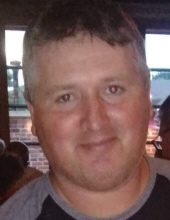 West Lee Overstreet, age 39, of McHenry, born November 30, 1978 was called to his eternal home by his Lord and Savior on November 16, 2018. He was a devoted Christian and worshiped His Lord and Savior with all his heart. West was an avid hunter, motorcycle enthusiast and was known for his outgoing personality and his contagious smile. He was a 1997 graduate from Stone High School, a 1999 graduate of Mississippi Gulf Coast Community College and attended University Southern Mississippi with a major in Criminal Justice and minor in Biology. He also attended Pearl Law Enforcement School and was a Wildlife Conservation Officer in Walthall County. Later on he received his Master’s Plumber Licenses and worked for Overstreet Plumbing. He is survived by his three daughters, Darla Ann Overstreet, Layla Kay Overstreet, Maria Lyn Overstreet all of McHenry; his wife, Kristina Overstreet of McHenry; his parents, Paul and Diana Overstreet of McHenry; his sister, Magee Overstreet of McHenry; his brother, Chase Overstreet of McHenry; nephew, Eethen Overstreet of McHenry and Isabella Overstreet of McHenry. Services will be 1:00 p.m., Tuesday, November 20, 2018 at Faith View Baptist Church in Saucier with burial to follow in Williams/Bond Cemetery in McHenry. Visitation will be from 1:00 p.m.-2:00 p.m. at Faith View Baptist Church. Moore Funeral Service in Wiggins is in charge of the arrangements. To send flowers or a remembrance gift to the family of West Lee Overstreet, please visit our Tribute Store. "Email Address" would like to share the life celebration of West Lee Overstreet. Click on the "link" to go to share a favorite memory or leave a condolence message for the family.